More than 30,000 LAUSD teachers are now on strike, fighting for the schools our students deserve. AFM Local 47 stands in solidarity with our dedicated sisters and brothers of United Teachers Los Angeles and encourage you to join us on the picket lines. To show our strength in numbers, please join with our entertainment union leaders from AFM Local 47, SAG-AFTRA and more as we welcome American Federation of Teachers President Randi Weingarten on Tuesday, Jan. 15 at 2:30pm at Hollywood High. Meet at the corner of Highland and Sunset* to join the picket. Wear your blue AFM Local 47 T-shirt (a limited number of shirts will be available on site) or something red (#Red4Ed). * Please consider taking the Metro. There is limited parking in the Sunset Blvd. and Highland Ave. area of Hollywood. Please observe all parking signs and meters. We cannot responsible for parking. 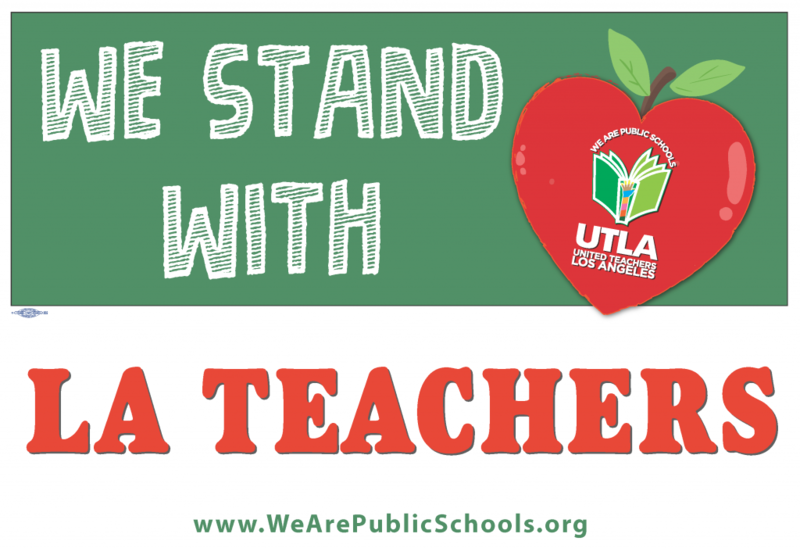 AFM Local 47 is proud to adopt Toluca Lake Elementary as our UTLA School Site in LAUSD. If you would like to volunteer or donate to help teachers, families and community members out on the picket lines, email press@afm47.org. Click here to sign up for AFM 47 STRONG Action Alert emails. This entry was posted in All News, Events and tagged LAUSD, UTLA on January 14, 2019 by admin.